I was fascinated by how many people were in Paris. The place was packed with tourist and local city kids. I had never been in a non-English speaking country (other than Mexico) so I felt overwhelmed. I use to want to live in Paris but being here made me change my mind on that one. It made me feel so far away from home. I continued to ignore the fact I was getting sick and pushed myself to go see the Mona Lisa at the Louvre. The Louvre is probably the best art museum in the world. I felt bad for the other great paintings for walking so fast past them. My body was about to give out, I only had a hour or so before I threw up on someone. The sight of the Louver made me forget how I was feeling. It was so great and beautiful. I felt like I had traveled to another time in history. The sight of the crowd in front of the Mona Lisa was more fascinating to me than the painting. Although I was taken by the color of the painting. So modern and beautiful. No reprint could capture the color of the Mona Lida. When we came out of the museum it began to rain. It made me think of that line in, “Midnight in Paris” by Woody Allen about seeing Paris in the rain. We went back to the hotel, I slept while Sam walked around the city. In the morning I felt so much better. We woke up early to go see the Eiffel Tower. I wasn’t going to leave this place without seeing its main monument. When we came out, the crazy busy streets of Paris were empty. We had Paris to our self. Each photo I took of the buildings looked fake to me. This place was real and I was in front of it. Call me selfish but it was nice to hang out by the tower with no other people around. It was time for breakfast. The local shops were finally opening up. We found this cute little restaurant that overlooked the city and tower. It was a dream come true. The moment was so nice I couldn’t stop smiling. We had a nice walk back to our hotel. It was time to head back to London. My two days in Paris was just a trailer to how amazing it really is. Amazing pics of Paris. The city is like no other. About now is a fantastic time to see the city – Paris in the springtime. Fresh, blooming, vital. Ques are lower, the difference being that two days can see quite a bit of Paris about now, whereas in high summer, pick a que and spend the day there. Given that there is too much to see in a week for the casual visitor, best to see as much as possible while constantly in motion (benches and cafes are so much better than standing in a line when “stationary” is required. What an experience! I am utterly jealous. Great photos, and I am sure some sensational memories. Thanks for sharing them with us. I´m going to paris later this spring. Do you know some nice and price worth place to stay in. Simply great….! I am amzed to see Paris from my home. You made the journey come live with your post. I love these pictures! It reminds me of home. You did well managing to be alone under the Eiffel tower, it is always so packed! gorgeous photos! I’m glad you felt better for your trip to the Eiffel Tower! And how wonderful that you got to see the city while it was quite! it surely be a romantic trip ! Beautiful shot of the Louvre, lovely lighting! Thank you so much for this. I love Paris and would absolutely love to be able to live there. The louvre was so busy when I was there in the middle of summer but still an amazing place. The most beautiful place in the world.I like all the photos of Paris.Really natural beautiful place. I enjoyed all the pics. nice shots, thanks for sharing! These are so beautiful! I’m really jealous. I’ve always wanted to go. Congrats on FP! Beautiful photos! My daughter has been asking me to take her to see the Eiffel Tower since she was 3. I hope to take her this year. She’s soon to be 6! Paris is my favorite place in the world and my adopted home, so I’m always glad to see other folks enjoying it. The craziness of the crowds can sometimes deter from the experience, it’s true, so it’s great you were able to also see the quiet contemplative side of the city. Love the second photo of you & la cathédrale. Thanks for sharing! Amelie is one of my favorite movies! Being from southern California, I wanted to visit Disneyland too. haha But didn’t have time. I’d love to go back when I’m married. That’ll be awesome. Wich part of California are you? San Diego?? I have a freind there!! I’m in the Inland Empire which is an hour away from the major cities here in CA. Road trips are awesome! Wow..your photos are awesome! Especially the ones inside the Louvre..they really wants me to come back and visit again Paris.. Very well documented journal..good shots and of course, one of the most good looking cities to be in! Aah, another post with gorgeous pictures that made me wanna go to Paris so badly. Thanks for the beautiful post! Stunning photographs. What a treat to see them and to get a quick glimpse of what has to be the most beautiful city in the world! That was a really nice photo journey through Paris. I liked the way that although you visited all those obvious places to go (Notre Dame, the Louvre, the Eiffel Tower) you did it with delicacy and really exquisite photos, taking pictures of the little details as well as the big, which really sets it apart. I particularly liked the note about finding your dream cafe in front of the Tower. Your pics are fantastic. I love the way Paris looks, and you captured all the things I’ve been dying to see. Great job! Gorgeous! I miss it! Your pictures are all beautiful. Wow, beatiful photos!!! Now I want to go to Paris!! Beautiful! Congratulations for such amazing photographs! Nice pictures, much more thoughtful than the usual “touristy shots” – I’m really fond of Paris, you capture the feel of the place well. Well composed blog with pictures. I like it. Great post! I love your pictures. I adore your photos! This looks like a successful adventure. Great pictures! I especially love your photos from the Louvre, brought me right back. Nice post. Thanks for the pictures. We were there this time last year. The gray weather looked about the same. I had just enough of Paris to whet my appetite, so I am taking my wife back for a visit this fall. You are right about the Louvre. The Mona Lisa is famous, but not the most impressive part of the museum by a long shot. Love this! We leave for London and Paris on Friday – your post makes me even more excited! Love all of these beautiful photographs of Paris. It’s a truly amazing city! When I went to Paris last year, the Eiffel tower was a must see for me as well. Did you go up in the elevator? The view from the top was the best part of my trip. I hope you get to go back soon. There’s so much the city has to offer and so much to see. If you want to see a little known but amazing view of Paris, go to the Galleries Lafayette. The inside is very beautiful and the scents coming from the market are to die for, but the real jewel is the view on top of the roof. I’d also highly recommend seeing both the Rodin Garden and the Musee du Orsay, especially if you love art as I do. We were at the Eiffel tower so early, the elevator was closed. Next time I go I’ll totally visit those places. They sound amazing. Great photos… ahhhh Paris…the food, the bakeries, the Eiffel Tower… ahhhh… I love it all! Thanks for sharing! Love the grade you’ve done on the photos. Beautiful use of colour. Do you mind if I quote a couple of your articles as long as I provide credit and sources back to your webpage? My blog site is in the exact same area of interest as yours and my visitors would definitely benefit from some of the information you present here. Please let me know if this okay with you. Thanks a lot! Stunning photography! I feel like I just took a trip — oddly, to a place I’ve never ever been! I loved the photographs of your early morning walk when all was quiet. The reflection in the restaurant window is one of my favourites, along with the carrousel. Hope you get back to Paris soon! Beautiful pictures! Congratulations on being freshly pressed. Paris is should be good experience. lucky who can seeing it. Beautiful photos! I only spent a few days in Paris several years ago and loved the beauty of the city — some day, I have to go back. Looks like you hit many of the top spots. Thanks for sharing these great pics! I look forward to a vacation in Paris with my wife ..
You are so cute! I love Paris, I have been a few times, but I still need to go back to add to my photography portfolio. Thanks for sharing. I used Lightroom to adjust the colors and the html photo settings for the pictures. 🙂 you can resize your photos in your full screen mode. Thank you for posting these pictures. I was there. when no digital Camera was invented. Much fun! You really captured the excitement. Thank you for sharing the photos. If you get a chance to go back to Paris, you must have dinner at sunset at the Le Jules Verne in the Tower. Also, right around the Tower is the Flower District…..great area to stay! The beauty and history of PARIS goes without saying. The pictures you displayed were just a wonderful touch of a place that most can only dream about going. Spending two days in paris just wouldn’t do me justice. I would need more. My first two days would be shopping and site seeing. Just wonderful. I can relate to you appreciating seeing the tower without the crowds. Great photos! They’re some nice photos 🙂 Paris looks great, even when the weather isn’t the best. I’m going there for the first time this summer, so definitely going to check out The Louvre! I read in a newspaper that there’s also a restaurant called La Petite Cuisine à Paris which is Paris’ smallest restaurant, set up by a woman from England, so I’d love to visit there as well. I have a photo of the Mona Lisa also. I was standing among a crowd of people and could not get to the front, so I held the camera above my head and took the pic. Surprise!, it came out to be the best shot that I took that day. I’ll always remember my day trip from London to Paris on the train, under the channel. Sounds like an amazing two days. Your story of waking up to a Paris free of tourists couldn’t be more ideal. I recommend you watch the film “Before Sunset” (and “Before Sunrise” first), it acts as a great love letter to Paris. wow, memories memories of Paris! looking through these pictures made me feel like i was on the trip with you! loved your photos. really enjoyed them. i am actually planning a trip to paris so your post made me wanna go even more. very cool stuff! Two days -but the memories last a lifetime! Thanks for sharing your trip. We spent two nights in Paris on March 2011 and I felt kind of the same: I had to pinch myself with all the beauty and the stunningly beautiful stereotypes! should i say – my europe visit must start with paris…………..!!!!!! I thought photography inside the Louvre was prohibited. Has that policy changed? I’m not sure.. I know in most museums they allow pictures but ask the flash to be off. When I was there, a few years ago, cameras were everywhere. I had no problem taking pics in the Louvre. Love all the pictures! Like the previous comment said, it’s great to see the “real” pictures of Paris, rather than what we see all the time. Love! Beautiful photos! I love how you managed to get the whole of Eiffel tower to yourselves! I would definitely love that too, but I just can’t wake up early enough! Hi! i’ve never been to Paris well never been to Europe, and this 2 day trip is amazing to me, nice pics! love them, by the way do you remeber the name of the street where there’s the corner building? How were there no other people around? I am jealous! Those are some fantastic photos! I would love to go there someday :). Thanks for sharing!! Thank you so much! Well the day before was St. Patrick’s day. I figure everyone was sleeping in from their hang overs haha. We were out walking around by 7:30am on a Sunday. It was a ghost town. Yeah two days wasn’t enough. It was just a trailer to a really great city. I would have loved to see France more. Maybe next time. Gorgeous photos!!! They make me ache with longing to go back (read: to run away from my life). It seems like you really did have a beautiful time there. And your perfect little bistro moment 🙂 ! Thank you for taking us with you on your two days in Paris. It was nice to see the city again through your photos and through your eyes. Cool pictures. How did you get away with photo taking inside the Louvre? Did you crack the DaVinci Code? How did you get all the people to stay home on that day the streets were empty? You must BLOG more about Paris to quench the thirst you created, more, more, please! Paris is a city of streets, museums and cuisine and you have captured that essence very well – for me it was nostalgia revisted. Love your pics – especially the wide angle ones. Thanks for sharing!! Weird. We were just in London and Paris for most of March, and from your photos I would swear you were following me. Did the gypsies do their deaf-mute scam on you? Were you staying in Montparnasse? If so, then did you go to Boulangere Jean-Paul Charbonnier? And I really hope you went to Montmartre and also the Pere Lachaise cemetery. Oh, and Eurodisney sucked. My friend worn me to watch out for ppl who were trying to scam tourist, so I was aware. There was so much I didn’t see. The first day I just wanted sleep haha. Thanks for the post!! The collection is simply awesome!! Wow, what memories. Plus ça change…Paris is always the same, year after year…well, almost the same. I miss La Samaritaine and C&A. Thanks for sharing. Looks like a splendid trip. And congrats for being on freshly pressed. I have only spent a couple days in Paris, but your experience seems like a dream. Being alone in the streets seems absolutely perfect. Hope I can take the hubs back some day. These are some lovely photos; off to explore Europe this summer, and was thinking of skipping Paris out, but I think you might just have changed my mind! 🙂 And may I ask just how early you got up to avoid the crowds?! Yeah its a place to see, almost too beautiful to be real. We were out by 7am on a Sunday morning. The first day we got there the streets were busier than New York!!! Okay, thanks, we will be sure to rise early then! Beautiful photos! Paris is such an inspiring city and definitely beautiful enough to run around for hours until feeling sick! Thanks for sharing..after reading this and remembering my first visit, I’m going to have to visit there again soon. I love Paris, not yet been up the Eiffel Tower, something for the future, with someone special. Must try to get there this year. I am so jealous of you! girl, your Paris tourist outfit is fabosh. Beautiful photos – thanks for sharing! Congrats on being FP! Wow, I loved this. It was like a mini-trip while sitting at the computer. Paris made me feel overwhelmed, too, and I had always wanted to live there. Thanks for a great story. Paris, in only two days! One could spend weeks, months there. The Mona Lisa definitely is an interesting exhibit, especially being as small as it is. Apparently many times when you go there you aren’t even looking at the real Mona Lisa (they have many stand-ins to help preserve its colors as well as protect from theft), seems like a trick 😦 The other thing that I found interesting was the Mona Lisa had an entire wall to itself, and directly opposite of it was a 10 meter large painting that everyone ignores despite its enormous size. Great photos. Two days is a very short time in that city. My wife and I spent seven days in Paris with our granddaughter four years ago and it was one of the best trips we have ever taken. Your photos do it justice though. I honestly feel that the food from Italy and Spain surpass the food from France, as well as the wine BUT, all three and marvelous. If you have never been to Italy–you and Sam put that on your “bucket list”. Sooo jealous!! I have always wanted to go to Paris and just sit in a cafe’ and eat cheese and watch people. Your pictures are beautiful! I so have to go. What was your favorite spot? Maybe it was the delicious breakfast but the cafe was my favorite spot. Sitting there made me believe all things are possible. Its crazy wanting to go somewhere for so long and finally being there. Hi there, Love your pics! and was researching on real write ups for a short visit to Paris. Whats the name of the cafe that was so cool? Thank you. The Cafe, I have no idea! We went to the one that was open early on a Sunday 🙂 There are heaps of cafe, I wanted to stop at all of them. Two days in Paris not enough…barely time for a relaxing lunch. Dont know how you got to see so much. Amazing pictures! I hope to one day wander through the streets of Paris. It must have been incredible to be at the Eiffel Tower with no crowds! I don’t know if you made it around the country, but did you see many hitchhikers in France? I have been doing a lot of hitchhiking in the United States for most of 15 years and there aren’t many hitchers in the States. I have heard that there are a lot more hitchhikers in Europe–I guess it is more culturally acceptable. All Europeans hitchhike, especially the younger ones. I hitchhiked through Europe, and it was great. All of them carry really big backpacks. The ones we carry are like baby things. There are a lot of hostels you can stay in and meet other people. The hostels are very inexpensive. Thanks for the pictures. They tell a remarkable story. I love Paris! Your photos make the city look even more serene and beautiful! Thanks for sharing! Wow I love your page! It’s awesome!!! Beautiful pics! How did you like the food? French food is amazing – so rich and satisfying! I wanted to try the snails but my stomach wasn’t feeling well the first day. The fruit was amazing though. Thank you so much. Since our flight was in the afternoon. We were out the door by 730am to see some of the city. Love your wonderful photos! Thanks for sharing! Ok, how come Paris was so empty that day you took those pics, what time was it??? Great! Oh, the Mona Lisa was a big disappointment to me…I mean, they put that damn round thing around it and you’re a billion feet away from it, there’s a billion people wanting to see it, and then there’s GLASS over it?!? Oh yeah, that’s what art’s about…NOT!!!! Anyway, the Louvre is amazing and I loved seeing all the other things (especially the sculptures!!!) except the Mona Lisa 😛 Still, I feel like I’d have to have at least a whole year to see everything in it!!! But it’s ok, it’s ok, I shall be back before I die!! I was more impressed by the color of the Mona Lisa. When I see it used in media it usually has a yellow tint to it. The other paintings in the museum were so amazing I couldn’t believe anyone could have the patience to create it. Yeah I love traveling and any opportunity i get, i go for it. The hard part in traveling is making up your mind if you should go. Reblogged this on A woman of faith. Great share, Monica! I’m not a fan of the Eiffel tower so I must to tell you your photo beneath makes me reconsider–It’s my favorite shot getting me in the mood to see Paris from different angles next visit. Paris looks enchanting. You did a good job capturing it’s charm and elegance! And that food…amazing or what??? Congrats on being FP’d and thanks for sharing your trip. I think it would be amazing to be by the tower with no one around. How did you do the one where it is on the ground? Thanks. I set my camera on a timer and put it on the floor. Since there was no one around we were able to have fun taking pictures. I had to read this! I’m going to Paris for three days in a couple weeks’ time! Just watched midnight in paris to get in the mood. Glad you enjoyed it… lovely photos. Merci. Vos photos sont magnifiques ! Beautiful pictures – such a fun trip – and you’re making me hungry! In a week in Paris, I saw the many phases of French love – a dramatic breakup, a cheater with his lover, and a sweet couple who charmed a man who looked like he belonged to another century. If you’d like a funny story about love in Paris, see http://4initalia.wordpress.com/2009/04/23/paris-scenes/. I am so jealous. I love the pic of you alone with Eiffel Tower. The Monalisa made me think, I need to possess it. Hey thanks for the tour. I dunno if I will visit Paris in my lifetime but I saw Paris so beautifully through your post. Thank you for sharing you experience. Great photo’s, the colour cast looks like it was dreary weather. Great pics! I never tire of Paris. Happy for you that you got to visit this beautiful and amazing city! Wow… I love Paris… and these photos make me want to go back so badly! Fantastic blog! Your photos are so sharp and clear – We went to Paris about two years ago and my obsession with returning is growing. Can you recommend any hotels in Paris? The one we stayed at was cute, Hotel was Hôtel Vaneau Saint Germain. The people were nice too. We hung out at the lobby using their free internet. There is a subway next to it and markets. 47 Avenue La Bourdonnais, 75007 Paris, France. They have two breakfast specials, which made things easy (since I didn’t know the language.) I got the English breakfast. Yum! Jealous. I was there years ago and hope to get back. I spent 3 days in Paris, got to see the Mona Lisa, the Eiffel Tower (a friendly Parisian lady escorted me to it), Notre Dame, Arc d’Triompe. If there are any Highlander fans here, check out Saint Louis de Pavre church near Notre Dame. It was Darius’ church in the series. When I visited Paris, it was in October and no one was visiting. I went to the Louvre, saw the Mona Lisa (there was no glass in front of it, that’s new), and no lines. I went all the way up to the top. Had to take 2 different elevators to get to the top. If you go back, visit Paris in October. All of Paris will be yours. wow! I wanna go to Paris! Paris is the city of heaven. Some of my relatives are living there. Its just full of beauty. I have not yet visited. Hope very soon i will go to my relatives to visit. Nice post. Its a album of beautiful Photos. I like it. Thanks. absolutely amazing photos! hubby and i went there last year in fall and did exactly the same thing on our first day while walking like a zombie in the city. the photos w/o people are so weird and cool! thanks for capturing such a rare sight! Great shots Monica, love it. We were in Paris a few days ago and you’ve shown me the limits of my photographic ability! Congrats, wonderful. I don’t know if I’ll ever get to Paris one day, but I sure am happy you took me with you through your blog. You’re lucky there weren’t many people when you went to see the tower. Why is that? My guess was that everyone was sleeping in from their hang over. The day before was St. Patrick’s day. haha. We were up and walking around by 730 am on a Sunday. It was funny cause in the middle of the night I could hear groups of drunk men singing in the streets from my hotel. The neat thing is that they actually sounded good. Wow! I can’t get over the amazing colours in your photographs! I like Paris and thanks for sharing. So lovely! When I first saw the Eiffel Tower, there was scaffolding all around it and you couldn’t go inside. Such a bummer that was! Looks like you had fun, hope you enjoyed it! great photos! i’m a photographer that lived in paris last summer, so i feel the language barrier struggle you felt. i wanted to live in paris so badly, until i actually lived there. coming from texas, it was a hard transition. but great photos!! Your post reminded me of the first time I went to the Louvre and saw the Mona Lisa – I was struck by how small the painting was, and with the crowd all juggling for best shooting position and their flashes reflecting off the security glass, she was mostly obscured from my view. I just have to get back there one day – and I will, being fortunate enough to visit in France every year! I want to go Paris!!! Especially I want to go “Notre Damie”. I like something like that. Paris is one of my favourite places in the world but it’s far better in the sun 🙂 It’s a very pretty place though. Great pix! Made me feel as though I were there. Thanks for the mini vacation! This is so cute. I love the way you had your pic taken in front of the all the landmarks. “Yes, I really was in Paris!” So glad you took the photo of the Mona Lisa, I saw it 20 years ago, I don’t know if they changed the surrounding area, but it was interesting to see it as part of an exhibit, and take a look at the frame. (Someday that will be one of my paintings, well, you can dream after you’ve seen the Mona Lisa!) I saw Paris in August, when everyone goes away, and most shops were closed. Congrats on FP! Reblogged this on Arte secondo me. Incredible photos! Paris is beautiful. Looks like you guys had fun! What lovely photographs, thank you for sharing them! I know exactly what you mean by Paris making you feel so far away from home, although you used to dream about living there – this is exactly how I felt when I visited it a couple of years ago. But this maybe makes it special in a whole other way! Great trip! When I went to Paris (also two days) with a tour, they gave us a courtesy coffee in that café; here in Venezuela we brag of having the best coffee in the world, and let me tell you…the coffee my mum and I drank in there was overwhelming. Sometimes we remember our trip and that memory never fails to makes us smile. As you said, Paris makes me feel so away from home, I wouldn’t live there, but I surely want to come back and go up the Eiffel Tower (because I was feeling awful and couldn’t do it :(, boo). Cheers, nice blog and nice photos. Awesome blog about your travels. I love the pictures. I was there 3 years ago and it brings back great memories. I went there when it was January and 45 degrees. Burrr. 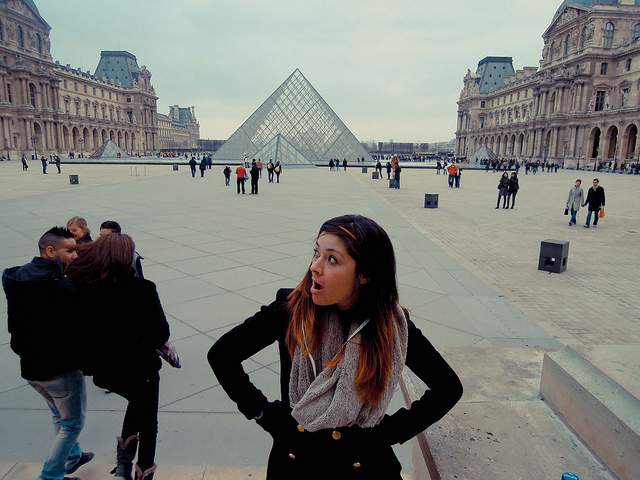 I got lost in the Louvre and at that point I was hungry and suffered from the jet lag you speak of. I could only sit on one of their benches and cry for fear that I could never find my way out. Poor me. Congrats on being freshly pressed! Really nice pictures, place and everything! Paris is a great place and we have lots of things to do there! That’s the best of the city!! You really did not have long enough. I have visited this wonderful city many times. Never for more than 4 days at a time and it is never enough. Hopefully your taster will act like a slow fuse and drag you back time and time again. I am pleased that you have managed to get to Paris but now you need to go back and soon. This is such a cute photo montage! All of your photos from your whirlwind trip are getting my antsy for my trip next year. Any places (aside from the Eiffel Tower and Louvre, as they’re already on my list) that you’d recommend visiting? I would love to visit Paris. It’s so beautiful! I also love Amelie by the way!, What I love more is Paris 🙂 I have lived there, visited there, and now I miss there, living in NYC… I am so jelous of your beautiful pictures, thank you for taking us on your beautiful holiday!! paris is amazing! great photos! This brought back s many wonderful memories! It’s always a good time to go to Paris. No matter how many times I travel there I always make new discoveries. Love your pics. No way! Really? Can you believe saving the money wasn’t the hard part but it was making the decision to go that was. I think you make a very good point, Monica! Sometimes we just have to “do it” or we might lose our opportunity! Hopefully my opportunity has not come and gone. Delta actually opened up direct flights from my city to Paris recently. What more of a “sigh” do I really need?! (other than money, and time, and all the stars aligning themselves…) Well, at least I feel like I’m one step closer to “la Tour Eiffel”! this was great – makes me want to post some pics of when I was there, back in 2006. Very nice – thank you for sharing these!! by the way…I loved the Louvre!! And the Eiffel Tower was breathtaking. Yes you do! He will know where to take you. Having a friend in a different country is the best. I love the perspective you took with shot shooting up under the tower. Great pictures! Beautiful pictures. J’adore Paris, aussi. great photographs. My favorite sits at the bottom. -looks like you had a nice adventure. Oh la la, thanks for the petite journey round Paris. Brought back great memories of my own trip. Nice photos! I also love to go to Paris. Especially in Louvre and Eiffel! Some of the places I would really love to visit. Wow, look whose famous! Haha. Love your pictures! Many look similar to mine. My family and I took a month-long trip to Belgium a year and a half ago and we took a 3 day side trip to Paris. Amazing! We can’t wait to go back! Stunning photography of a stunning city. I also toured Paris for two weeks almost exactly a year ago with my husband. It was the vacation of a lifetime. Thanks for bringing me back. Love the pictures, and what an awesome two days. Really love Paris, definitely a fabulous city. Glad you enjoyed it! Paris is really beautiful, I would love to visit there. Reblogged this on Mbconsulting's Blog. I know what you mean about the jet lag! I recall that very well. I loved Paris, but I loved the little villages of Provence even more. I love Paris. It has a certain atmosphere like no where else I have ever been. It is like it knows it is the most beautiful city in the World. Reblogged this on l'écume des jours. Where I want to live when I grow up! i love the movie two days in paris too. maybe that’s the most exciting amount of time one can spend in paris. i can’t wait to be in paris. Your pictures and your writing transcend time and space. It felt like I was there. Aw I love you ang!!! Thanks for the early morning tip for the Eifel Tower..answered one of my questions 🙂 Sounds Beautuful…I’m going in August…can’t wait!! Thx..
It’s nice to see that our capital is so much appreciated ;). I had the chance to live 1 year in the Big Apple when I was young. It was the same for me at the time : everything was just amazing. Mon anglais n’est pas très bon, alors je vous dis au-revoir dans la langue de Voltaire. Bonne continuation c’est un super Blog! this before. So nice to discover somebody with a few unique thoughts on this subject matter.